Tonight! It’s the top ten boys! Please don’t notice them! Also, please don’t use your Supervote on them! For real: Nobody even mentions the fact that you can vote 50 times at all, ever. Anyway, let’s spend two hours on ten guys a whole network is actively rooting against. Young Elijah Liu is being cast as the young heartthrob, and it’s a role he’s not well-suited to, because he has an absolute blue-sky maximum of three pubic hairs. His version of Rihanna’s “Stay” is perfectly fine, if a little monochromatic. Still, Nicki says she can see his face on blankets and sheets, New Kids on the Block steez. Randy cuts in with “ … and pillowcases? HA HAAA.” Yes. Yes, Randy, pillowcases are also included in the category of “bedding.” Why are you here? We’re stuck with Bruno Mars as a pop star, aren’t we? Cortez Shaw does “Locked Out of Heaven” pretty much straight-up, and I wish he would have done something with the arrangement to show off the fact that he has soul. Instead, we are stuck with a charismatic guy doing a warmed-over Police track that Jason Mraz himself would call anemic. The judges all call him out for straining for the high notes. I like this man, and he’s a much less statutory-rapey choice for this season’s Casanova, but I worry for his future. Nick Boddington does the Goo Goo Dolls’ “Iris,” which you can tell he chose for the relevance of the “I just want you to know who I am” lyric, but after Charlie’s display, it’s the “you can’t fight the tears that ain’t coming” line that stands out. You know all these guys are kicking themselves for being so emotionally stable. Anyway, he does his thing with it, which is a thing I like, but the judges are lukewarm. Really, it’s all going to come down to how young female America likes guys who look like they have mono all the time. Oh my God, Burnell Taylor. Burnell Taylor redoes “I’m Here” from The Color Purple, and it is just gorgeous. There is an ache in his voice that is honest, and it makes a showtuney showtune like this really pop to life. I feel like I’ve just tuned in to the end of an eighties movie where a sassy, multicultural bunch of kids use their pluck to save a community center. The judges love it. It’s times like these when you wish there weren’t four judges, because there aren’t four things to say about a performance like this. It’s perfect, period. Everyone shut up. Here’s another simple thing to say: Paul Jolley is a bumpkin Stefon. We get all kinds of footage of his hometown send-off dinner, and this party has everything: streamers, folding tables, a small number of sad-looking people attempting a wave, and that thing where it all reminds you of that picture of Kirk Cameron’s lonely birthday party with the Subway sandwiches. Performance-wise, he’s reaching for a male version of the pop-country thing that Taylor Swift owns right now, and if there’s ever going to be a gay country guy, that subgenre is his way in. And if Paul is going to be that guy, he’s going to have to start having more fun. Relax, Mary. P.S. : Are there any heterosexual men in this group? Signs point to no. Stutterer Lazaro Arbos is in fine voice, and is handsome, and is wearing neon pink, and there’s not a whole lot else to say. His voice is perfectly okay, though undistinguished, and without his sobby backstory he’d have been lost in the shuffle. I believe he’ll go through, but I don’t see him lasting very long. Maybe he should try singing in Spanish? Or crying? Remember that video of the fireworks display in San Diego where every rocket went off at the same time? That’s how I feel about Curtis Finch Jr. It’s all grand finale all the time with that guy. He can obviously do it, and this is obviously not the time not to do it, but I’m looking forward to seeing some dynamics. Obviously, he sings “I Believe I Can Fly.” You knew that. 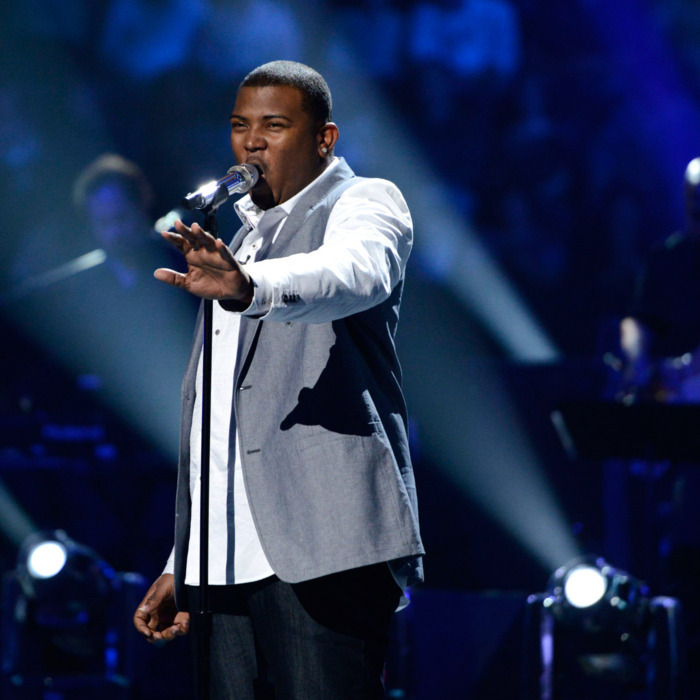 People who have never heard of American Idol or R. Kelly could take one look at Curtis Finch Jr. and say, “Oh, he’s going to sing ‘I Believe I Can Fly.’” Anyway, the judges love it. (People who have never heard of television could tell you the judges would love it.) Everyone seems to agree that the world needs his positive outlook, with Nicki and Mariah hitting that note the hardest. Hey — charity begins at home, you two; shake hands and get over it. A quick aside: Mariah talks about how much negative energy is in the air, and as someone who has tossed some shade her way recently, let me mitigate the bad juju. Mariah clearly knows what she’s talking about when it comes to singing, but the imperiousness with which she approaches this job makes it impossible to care about what she says as a judge. She has cast herself as the sighing, over-it queen of the show, when really she should be showing a bit of emotion. Now is not the time to be reserved. Mariah: Next time Nicki says something, stop stroking your hair, wipe the put-upon look off your face, and take a note, because right now she is straight up drinking your Ensure. I believe you can fly. Devin Velez is there to honor his mother, and he’s honoring his mother to make it so you don’t vote him off. He’s in a red V-neck and a bow tie and it’s very Pee Wee Herman on casual Friday. Spanglish “It’s Impossible.” He’s too young to know that Andy Williams was a human bowl of warm milk, or that this song has already been done definitively by Steve Martin, so it just comes off like a nice kid doing a nice performance. Nice. It’s nice! Is nice what you want this far into a two-hour show where you’re singing for your life? Maybe not. Vincent Powell brings up the rear with Boyz II Men’s “End of the Road,” which is a song on which I hit my quota back in 1993, so now I literally can’t hear it when it’s playing anymore. I hear cartoon sound effects now: approaching trains, screeching cats, boo-woop, boing. Yes, every last drop has been wrung out of this song, and I’m sure he does a good job — the judges seem to think so — but I like him and I want him to stand out, and you can’t stand out when you’re singing the sound of an oscillating fan. So there it is, and I seriously have no idea who’s going through, outside of Curtis, Burnell, and probably Vincent. I think Charlie has a decent chance, as he’s a male Zoanette who probably has a thick file in his high school counselor’s office, and the potential bloodshed will be too tempting for our Vote for the Worsters to refuse. I’m rooting for Nick, Paul, and Cortez, but really I wish they’d give a couple more spots to the ladies. *Actually, he doesn’t have the mustache. His intro package is all about it, but when Nicki tells him to shave it, he says, “I already did.” That’s how wispy the mustache was: It looked exactly the same as no mustache at all**. **I can’t believe how many times I have used italics to talk about Charlie. I think that’s probably a good sign, right? Right?